Graduating in 2001 with a degree in biomedical science from King’s College, London, tea designer and Quinteassential founder, Bernadine Tay, started her career in marketing. In 2008 she moved on to pursue her true love in the tea business. Using her scientific knowledge to create unique blends with exquisite flavours, she has since won 9 Great Taste Awards out of 12 blends to date. Bernadine is also a trained tea sommelier and is now also a tea judge. She is also one of the founding members of the European Tea Society. Bernadine poured her heart into this tea venture. After a period of intense self-study and mentoring with the renowned tea expert, Jane Pettigrew, she finally made her debut in the small stage: the farmer’s markets in the North West. For about three years, she honed her craft and refined her blends by talking to tea lovers from the quaint villages of Alderley Edge to the metropolitan city of Manchester. Gleaning inspirations and ideas with fellow tea enthusiasts, she soon gathered a loyal following among the North West’s farmer’s market circuit. After a year of hiatus due to an injury that almost paralysed her, Bernadine decided to unveil a new Quinteassential with renewed passion. Whether the refreshed brand is a symbol of a new Bernadine, it’s undeniably an amalgamation of all that she loves. Tea, travel, art and all good things preserved in unforgettable memories. The enjoyment of flavours is about more than how it tastes as taste is a multi-sensory experience. 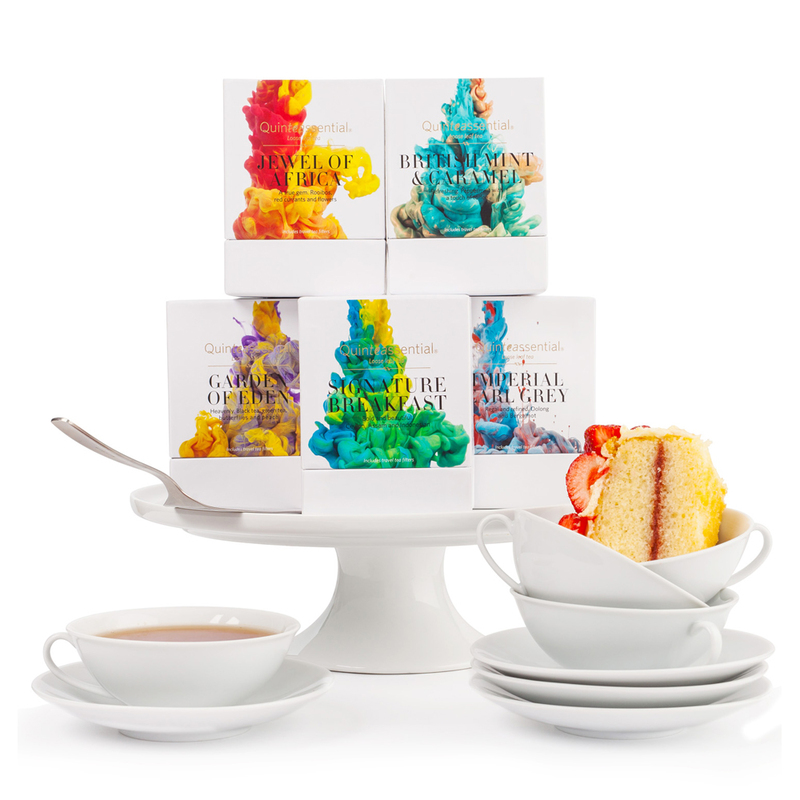 Quinteassential’s packaging express flavours not just with words, but through a spectrum of colour and energy using ink and water unique to each blend. We commissioned Italian photographer Alberto Seveso to create nine unique canvases, carefully matching colours to flavours and aromatic notes, developing a story and evoking a sense of individuality for each blend.